Kami menawarkan kayak memancing off Tioman - orang-orang yang tidak terlepas! In recent years, kayak fishing or kayak angling has become hugely popular in our neck of the woods The reasons are three-fold. 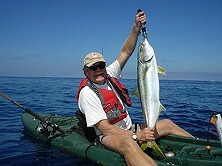 First of all, no type of fishing is as hands-on as kayak angling. You're so close to the water, you're almost in it. In fact, the action is so nearby that by the time you're landing your catch, you'll be soaked to the bone from all the in-your-face splashing. Not that you'll notice it much, because you'll be buzzed to the max. Which brings us to the second reason. 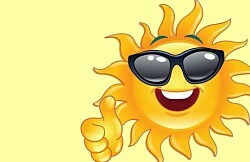 Wet or dry, it doesn't matter, because here in the tropics, you won't feel cold either way. 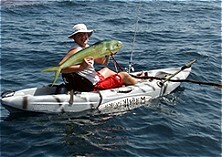 But perhaps best off all, a kayak allows you to get right amongst the fish, swiftly and stealthily. And this is where we come in. Tioman is surrounded by a no-fishing zone, but from 2 miles out, you can fish to your heart's content. So, you can use our kayak to head out off-shore by man-power or have us take you to the fish by boat, kayak and all. This second option saves you energy, which you may need later to chase after a feeding school of barracuda or trevally. Whichever option you choose, you'll likely be reeling them in before you can say hook-up!, because Tioman's off-shore waters are positively teeming with pelagics of various kinds. Just head for the "nervous water" and you're away. For obvious reasons, this kind of off-shore kayaking requires a minimum of 2 stars, so please bring proof of your certifications. And lastly, wearing our life-jacket, provided free of charge, is compulsory while kayak angling. Ready for some kayak angling action? Use below form.